For the following sixteen reviews the theme will be based on the LA Cupcake Challenge that I attended last week with Ashley. As foodies, we were blessed with opportunity to go to downtown LA and sample 36 cupcakes from 16 different bakeries in Southern California. 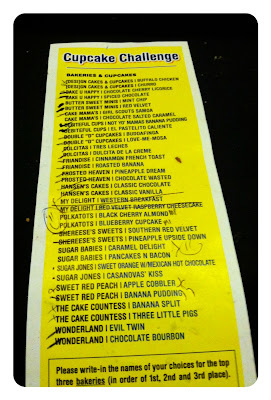 Upon arriving we received a ballot card with a list of all the bakeries, which cupcakes they made and then three slots for the tasters to decide who should win first through third place. 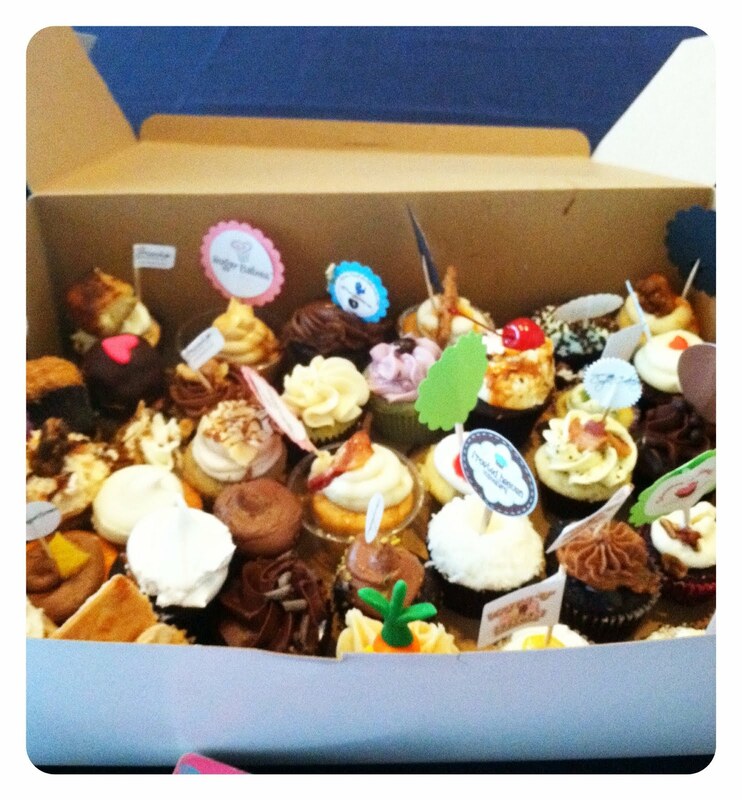 My mini reviews of each bakery will showcase the most creative cupcake that each competitor came up with and at the end I will post the pictures I have of the ballroom where the event took place. This cupcake I wanted to try right away just because of how vibrant the orange was and how well it stood out in my sea of delicious treats. The first thing I noticed about it was the light scent of fresh oranges that came from the cake and then I realized it had a fresh orange chunk on top of the frosting. 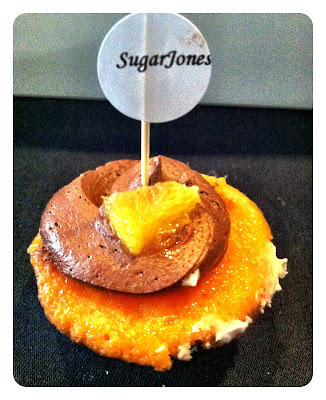 The combination of flavors for this cupcake is best described as one of those orange chocolates you can rarely find anymore. You know the ones where you have to slam it on the table for it to break apart into textured pieces of chocolate that resemble an actual orange? Yes, that’s the exact flavor with a hint of spice from the frosting. The Mexican hot chocolate frosting was definitely a memorable taste at the event. 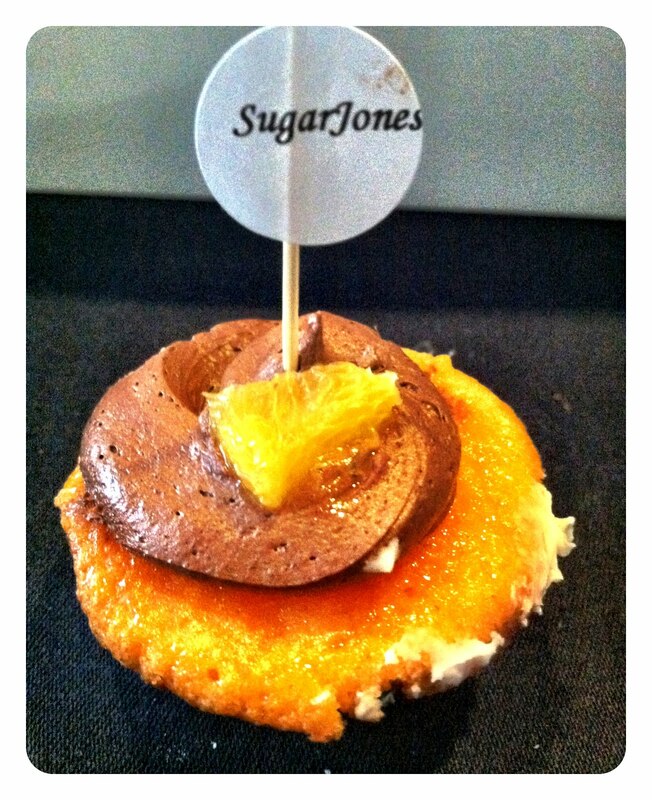 The bakers at Sugar Jones really perfected the art of making this topping taste exactly like that hot drink. The chocolate was rich, smooth and spicy and because the orange cake had a really light flavor, they both paired beautifully together and made for a creative and aesthetically pleasing entry for the competition.